My whole life I have been surrounded by creative cooks. From my mom fixing up schnitzel and spaghetti carbonara in the kitchen to my boyfriend, Daniel, mixing up a new pastry or challenging dish, I am never without a new treat to try. In Oman I am surrounded by new foods, but there is a simplicity in the palate that I’m not used to—unless I’m eating at an Indian restaurant where they bring on the spice. The important element of meals is not necessarily what is on the plate, but who you are sharing the plate with. There are some treats that I grab on my way to meeting someone, and other meals that center on sharing them with your neighbors or family. However, every Omani dish I have had was in a hospitable, friendly setting. In a typical Omani home, a specific room called a majilis is designated simply for hosting. I have been to a few different majilis and each one is different. Otherwise, we would share a meal in the hadeeka (garden). Men and women typically eat separately and typically in a home if possible there will be a men’s and a women’s majilis. 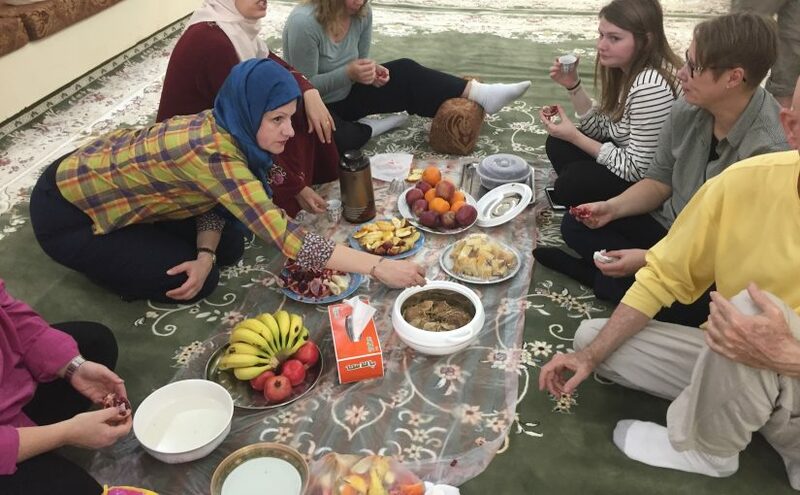 This took some getting used to, and I will admit to not enjoying every flavor of every food, but the time to sit and have conversation is where I learned most about Omani culture and Islamic tradition. Some of these items are not unique to Oman, but either brought from Indian cuisine or a general favorite across the Arab world. I’ll do my best to dish out which is what. I’ve had these prepared in many ways and every time they have tasted different. I cannot hope to replicate the dishes, but I’ve enjoyed sampling. Let’s start with dessert…. Halwa is the most traditional dish for a sweet bite and is uniquely Omani. It’s a unique combination of tapioca, spices such as saffron, ghee, cardamom and nutmeg as well as rose water, and assorted nuts. The consistency is similar to sticky jello. Sometimes fruit or date paste is added. The best halwa I had was fresh at the Muscat festival. The picture is warmed and wrapped around and around a hot bowl like taffy. Fresh is the best when it comes to halwa, but I have been offered a free bite from every tourist spot and bakery. Qahwah (coffee), Chai Karak (tea), and juice are all offered in every “coffee shop” around Oman. Each is a social drink and consumed several times daily in small paper cups. It’s hard to imagine coffee when it’s not in a big mug, however the cardamom coffee that is unique to the region is hard to take in big quantities. So, little porcelain cups in homes are used to share coffee with guests. Traditionally, guests shouldn’t drink more than three cups when visiting. I will miss the karak tea most because it is sweet and the first drink Shah brought me when we met. No two cups of karak taste the same. When my language partner made me some in Ibri, I almost didn’t recognize the combination of spices she used versus the coffee shop on the Mutrah corniche. But, one thing is guaranteed: the tea will be sweet. My absolute favorite snack in Oman is samosas. Samosas are most famous as a side to your Indian restaurant’s main course. However, they are found all over the Arabian Peninsula as well. Samosas can be stuffed with anything from vegetables to chicken. My favorite were in Ibri right across from my language school. These were stuffed with potatoes, onions, cilantro and a combination of spices. It took everything I had in me not to get a couple every day. By the time I left, the men in the shop knew me and always asked “samosa?” when I walked in. In Muscat, we get plenty of smaller, crispy samosas when we visit Shah. These are made of a lighter dough and are always fresh when we get them from the coffee shop on the corniche. Tabouleh is a salad with a parsley and garlic base, cucumbers, tomatoes and lemon. I was familiar with this snack from home, but the garlic is much heavier here in Oman. Occasionally I feel I am not getting enough grain from my normal diet so I’ll go grab tabbouleh to boost my iron. I just might brush my teeth four times that day! Litchi, Bananas and coconut are my fruits to throw in my bag for a snack. Coconuts are grown more in the southern city of Salalah. For part of my spring break I spent a few days in the sun and my taxi driver dropped me off on the side of the road to have a vendor chop off the top of a fresh coconut for a drink, and hand me a banana. Litchi is a fruit I never have back home. I feel as if I’m eating a rose, and I love litchi juice as well! For lunch with guests, fresh goat and rice are typically the first pick. After sharing qahwah the main meal will come out. On one occasion on a visit to a farm, our group was met with a huge platter of rice and meat. Half the goat went to the women, and the other to the men. We all stayed around the platter and pulled off the meat with our hands and some of the women helped us scoop with our hands. Out of this struggle came laughter and joking and fun memories. I also had a bit of the brain…how’s that for a cultural experience? Pita, fatoush and hummus a typical snack! There is a frankincense burner in the back too! Among with goat meat, camel kabobs and chicken are common to find in town. In Salalah we tried some camel from a shop off the road. 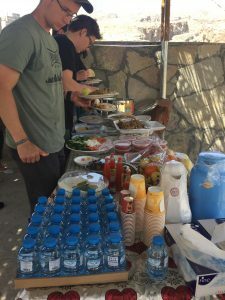 During the week in Ibri, camel kabobs hit the spot when we wanted some added protein. A man just down the road would grill up the kabobs next to his car and smother them in a spicy sauce before smiling and handing us our lunch. Shwarma is a great combination of chicken, sauces and maybe some veggies wrapped in pita. It’s great for a lunch or late-night snack and has definitely become a part of my weekly diet in Muscat along with a large watermelon or lemon mint juice. One of the best places for dinner in Mutrah we refer to as “Plate o’ meat”. The mixed grill of lamb, beef and chicken along with hummus, pita and a side of fatoush (basic green salad with fried pita chips on top) is perfect for a big meal. This is a typical middle eastern mix of dishes along with mint tea to finish. Of course, I have to finish with the most popular part of the Omani diet: dates. I’ve mentioned them before and I’ll mention them again because every Omani home has a stash. When visiting Nizwa, I saw more dates than I will probably ever see again in many, many varieties. The date trade has been present in Oman for centuries and most are still picked off the palm trees individually. On one visit to a farm, try the process of wiggling up the trunk of a palm tree as a date farmer would. I finished with nothing but several scratches to show for it.